Fort Astoria (1811-1824) (1830-1848) - Established in 1811 as headquarters for the Pacific Fur Company at present day Astoria, Oregon. The fort was sold to the North West Company at the beginning of the War of 1812 and later became a Hudson's Bay Company (HBC) fort in 1821. Closed in 1825 when the HBC moved to Fort Vancouver. The HBC reactivated the post in 1830 and it remained in operation until 1848. 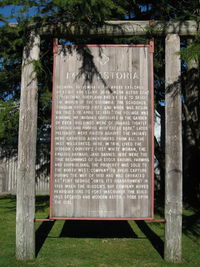 Fort Astoria was established in April 1811 as headquarters for the Pacific Fur Company when the company arrived on board the Tonquin, captained by Jonathan Thorn. By the time an overland party joined them in February, 1812, they had constructed a trading store, a blacksmith's shop, a dwelling house, and a storage shed for pelts acquired from trapping or trading with the local native Americans. Cannons were arranged around the perimeter for defense. The outpost was to serve as an administrative center for various satellite forts such as Fort Okanogan. The War of 1812 resulted in Astoria becoming Fort George (1) under British rule. On 12 Dec 1813, Captain Black, commanding the British corvette Racoon arrived at the fort. After dinner, a British flag was run up the staff, across which, Captain Black broke a bottle of Madeira wine, loudly declaring that he was taking possession of the post in the name of His Royal Majesty. He then changed the name of Fort Astoria to Fort George. The fort had been sold to the North West Company at the beginning of the War of 1812 to prevent its confiscation by the British. The fort was renamed Fort Astoria after the British left in 1818 but the North West Company remained in control of the fort. In 1821 the Hudson's Bay Company and the North West Company merged and took the Hudson's Bay Company Name. 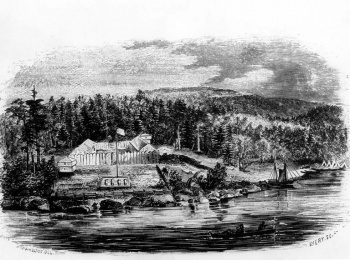 The fort was abandoned in 1825 when the Hudson's Bay Company moved its fur trading operations to Fort Vancouver because they feared an American takeover of the post. The HBC reactivated the post in 1830 and it remained in operation until 1848. 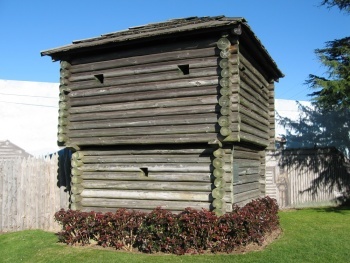 A replica of the fort blockhouse is operated as a small city park inside the city of Astoria. This page was last modified 10:02, 17 March 2019 by Bill Thayer. Based on work by John Stanton and FortWiki user Tsarevna.